Welcome to Luxury in the Desert! Absolutely stunning 5 bedroom, 3 bathroom home on huge cul-de-sac lot in desirable Las Sendas gated community. This gorgeous executive home has custom touches inside and out! Enchanting courtyard leads to custom front door. Vaulted ceilings, arched doorways, beautiful handscraped hard wood floors, plantation shutters, formal living and dining rooms. Gourmet kitchen boasts granite countertops and island, custom cabinetry, high end commercial grade appliances, and travertine floors. Upgraded master suite has separate tub and shower, walk in closet. Resort-like back yard with spacious grassy area, putting green, large gazebo with fireplace and built-in bbq, and sparkling pool and spa with travertine deck. 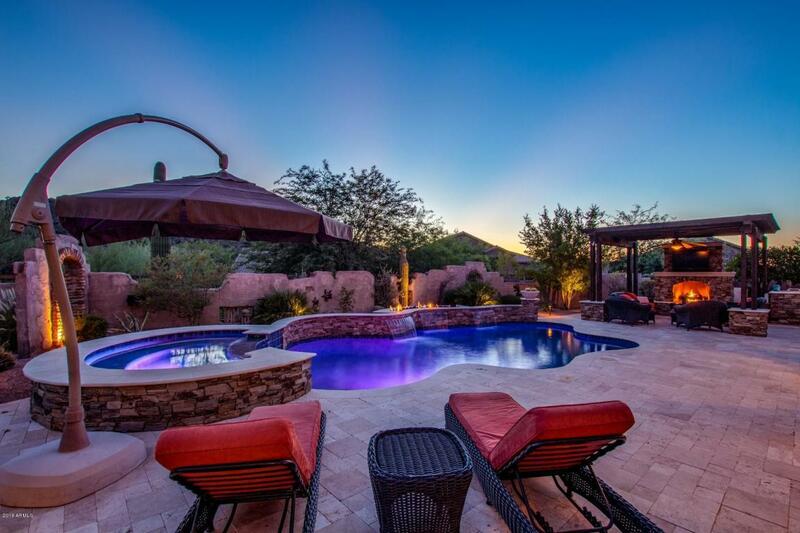 Desert Living at its Finest!